It’s no secret that the workplace is full of office politics and gossip. This is the natural result of human interaction taking place. The bottom line is: There are so many other ways to communicate, so why would you participate in gossip? Most people would answer no. With that said, don’t spread gossip. Realize that whether you like it or not, gossip and office small talk is probably never going to go away. When people feel dissatisfied, they want to talk about it. Gossip and small talk have a snowball effect because it puts dissatisfaction into others. The result is that small talk can eventually escalate into large generalizations. However, information relayed as gossip and rumors in the workplace can be beneficial if you know the proper way to receive and handle the information. Gossip and office small talk can be a very powerful force in the workplace. Since gossip is inevitable in the workplace, we might as well work with it and set up some rules. We need to be able to discern between good gossip and bad gossip. Good gossip is small talk with an element of truth to it, doesn’t hurt individuals, and is not malicious in nature. Bad gossip is malicious and founded on deception. Not only does it carry harmful effects. It hampers the spread of good small talk that can be valuable to us and the organization. The following are some pointers by which you can discern the difference between positive, informed small talk and negative, malicious gossip. When you hear gossip, try to figure out where it comes from. The closer you can get to the initial source, the better a vantage point you have to ask yourself why the gossip was spread in the first place. If the information is helpful in the workplace, then chances are good that the gossip is spread with Noble Intent. On the other hand, if it seems likely that the gossip was spread in order to ruin the credibility of a particular person, then that piece of gossip is likely to be bad gossip that is malicious and harmful. In addition to “what” the gossip is, it’s also important to know “who” spread it. Be particularly wary of gossip spread among people who have had problems in the past. This kind of information is rarely objective or informed. It usually carries some kind of malicious intent. Also of concern, are sources that are uninformed. Many times, people will spread false rumors to appear as if they are privileged to certain information. No matter what the reasons are, this type of source should not be trusted until substantial information proves elsewhere. Finally, take a look at the possible outcomes that might result if you were to let the gossip spread. Will it influence managerial decisions at some point along the line? Does it run the risk of getting you into very bad trouble? In most cases, gossip that carries a risk of high-importance consequences should be curtailed immediately. Ultimately, it’s unwise for an organization to allow this type of bad gossip. 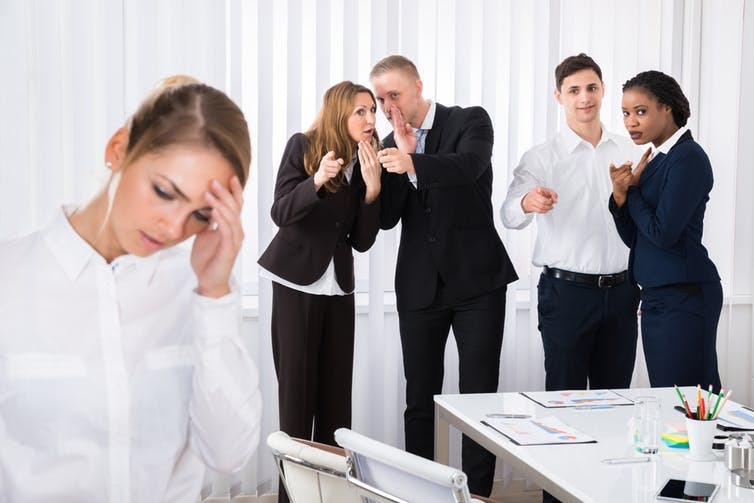 While gossip can provide important insights into subjective situations such as company-wide dissatisfaction with a particular policy or the unwanted behavior of an employee, this type of message should never be spread. It carries the potential of affecting things on a grand scale, whether positively or negatively. Gossip and office small talk provide a quick and subtle way for new employees to fit into the organization and learn about the people working there. For instance, if a new hire is told something like “be sure not to miss any meetings scheduled by Miss X”. The new hire might infer from this information that Miss X is notorious for her insistence on punctuality. So long as this information is founded on truth and with good intention, it can be a valuable tool for helping to bring a new employee to your company culture. This type of information can also be helpful to give insight into how the different departments work without bringing little office quirks into “official” training. In general, gossip allows us to humanize those we work with so that we can develop more trusting relationships. It’s only natural that there will be less than perfect openness between employees and their supervisors. This is because the supervisor usually holds a great deal of control over the immediate future of the employee. Because of this, there will inevitably be gossip and speculation of the supervisor’s personal life and certain qualities. As a result, they will be more open with the supervisor, provided that the gossip isn’t slanderous in nature. Gossip or small talk can also be used as a valuable marketing tool. Studies have indicated that most traditional advertisements are noticed by the viewer only a quarter of the time and passed on to others even less. Gossip has a tendency to be passed on by word of mouth nearly 75% of the time. This means that you can effectively use gossip to your benefit by discretely disseminating information about an upcoming product or company function. This type of information becomes a form of viral marketing. You can even influence the overall company culture by spreading information in a controlled and calculated manner. Gossip is an aspect of reality that we must be able to face. Gossip and small talk will occur if we’re going to be interacting with others in the course of our daily business. However, by using a little common sense and restraint, you can turn gossip into a positive tool for improving yourself, your coworkers, and your entire organization. Enabling Professors & Students to understand how behavior affects careers, decision making, and choices.